Buen whisky y un guía, Andrew, muy simpático, detallista y con una gran cultura acerca de la historia del whisky irlandés! Very highly recommended. Guide Owen was fantastic with an in depth knowledge of whiskey and a great guy - I learnt so much from the careful selection of different Irish whisky to demonstrate styles and characteristics. Visiting three different bars was a real bonus being a perfect introduction to Dublins night life. Fantastic! I only had 1.5 days in Dublin, so glad I chose this as my main activity. The guide was extremely knowledgable about whiskey and Ireland in general. Highly recommend. It was really cool to go to various pubs and learn their origins as well. Outstanding in every way. I originally thought this was going to be a massive tasting with dozens and dozens of others. That' not the case at all. We had a total of six people in our group. You taste a total of five whiskeys at three different bars within easy walking distance of each other. The tour guide was truly a professional and knew exactly what she was talking about. This was absolutely best tour I have ever been on. I don't like 'feeling' like a tourist... and the way that this happens - it's like you're a local trying to get some more knowledge about the incredibly interesting world of whiskey. Highly, highly highly recommend. My husband and his friend went on this tour. They had an amazing time. The tour guide was very friendly and informative. She gave amazing suggestions and the whiskey was delicious. We even ended up buying some of the ones they tasted before leaving Dublin. Highly recommend booking this tour! Great tour if you already know a little about whiskey but want to know more. Super knowledgeable guide, can't remember her name but she liked Star Trek so that's good. The tour seems to be very adaptable to which type of group they have which is great. Got some great new whiskey ideas! great tour, really enjoyed learning more about whiskey and also checking out some cool Dublin pubs I might not otherwise have visited. This was a really nice and informative tour. Our guide canceled and the owner of the tour had to come in from 40km away - but he did! I admire that he made the effort because it literally was last minute! We had some great whisky's and went to classic locations. I highly recommend this tour! This was great, the women who took us around was real informative and very nice! We learned so much about whiskey. 5 samples was really fine. The guide is very knowledgeable and personable. 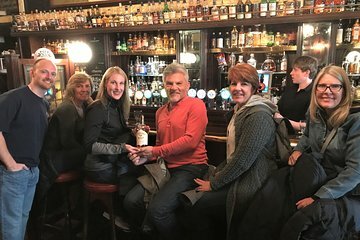 I would highly recommend this tour to anyone with an interest in Irish whiskey.